The passage of a new health insurance plan by the Lake County Board this week drew warnings from the circuit court clerk and the union representing employees in that department to reconsider part of the plan or face an unfair labor practice charge. Circuit Court Clerk Erin Cartwright Weinstein called on the board to reject the plan because many of her employees had been encouraged to open a Health Savings Account (HSA) as part of their insurance coverage because it would cost the county less. Under the new proposal, the county’s contribution to the HSA would be reduced by $50 for single coverage and $100 for family coverage for the second year in a row. The county presently pays $1,200 for single coverage and $2,400 for family. “My employees have come to me feeling betrayed that they were made a promise that the deductible was going to be given to them in exchange for the county being able to use a health insurance plan that would be less expensive to the county overall,” Weinstein said at Tuesday’s County Board meeting. Colin Theis, a staff representative with the American Federation of State, County and Municipal Employees (AFSCME) Council 31 — which represents around 105 circuit court employees who are not managers or supervisors, along with employees of the coroner’s office — also warned that any unilateral changes without negotiations would be considered an unfair labor practice. “We have six months to file an unfair labor practice (charge), and we have some negotiation sessions coming up. We’re getting close,” he said when asked Thursday when the charge would be filed. Theis thanked Weinstein “for standing up for her employees” in front of the County Board. He said the cost savings of the measure was $50,000 to $75,000, and considering the county’s 2018 budget is $437 million, he added that the change is literally a fraction of a percent of the overall budget. Some of the other changes in the insurance plan included a 5.7 percent increase in premiums for all employees and an additional 2 percent increase for those choosing a premium Preferred Provider Organization (PPO) health plan. The plan also calls for a premium subsidy for part-time employees of 25 percent if they work between 12 to 24 hours per week and a 50 percent subsidy for those working 25 hours to 37.5 hours per week. County Board Member Sandy Hart of Lake Bluff voted against the health plan, but thanked the board for taking care of part-time employees, which county board members are also considered to be. “Since we are part time staff, I’m thankful that it’s going to be offered to other part-time employees,” Hart said, adding that she would still be voting against the plan because of the other objections made by Weinstein. Both Hart and Weinstein are Democrats. Theis said the increase in the HSA cost was the biggest problem, because even the 5.7 percent premium increase for a simple HMO “would be under $10 a month,” he said. AFSCME won the right to represent the court clerks in August of 2014, but the union was unable to negotiate a contract with former clerk of the circuit court, Keith Brin. He then lost the election to Weinstein in the fall of 2016. Besides Hart, board members Judy Martini of Fox Lake, Terry Wilke of Round Lake and Vance D. Wyatt of North Chicago voted against the health plan. Paul Frank of Highland Park recused himself from the vote for personal reasons. County Administrator Barry Burton said Friday that the HSA account policy started with large contributions by the county, but the payments have been been scaling it back so they are more in line with the industry standards. “We have had increased health insurance costs, but it is well below the national average,” he said. He said most of the employees use the HMO option, which has a cap of $5,000 for out-of-pocket expenses, then everything is covered after that. The county self-insures, but contracts Blue Cross Blue Shield to administer the plan. The single employee pays $61 per month and the county covers the remaining $686 of the premium. The employee pays 10.2 percent of the premium for a single under the Consumer Driven Health Plan and a family plan pays 14 percent of the premium. “We want to be competitive and be a good employer,” Burton said. An outgoing county board member says he's against a proposed a statewide property tax that could raise levies by almost 50 percent for the next 30 years, though he voted against placing an question about the measure on the ballot for Lake County voters to consider in November's election. "I voted against putting the question on the Ballot since it will have no impact," Lake County Board District 14 representative Vance D. Wyatt told the Lake County Gazette. "As I stated on the floor at our August County Board Meeting, I believe that it will pass overwhelming and I think it's just a political maneuver." His opposition to having the question on the ballot doesn't mean he supports the proposal behind it, Wyatt asserted. "I don't agree with the proposal by the Federal Reserve as an avenue to solve the state's pension issues," he said. "Illinois has had major issues with spending over the years, which has caused unnecessary burdens on local governments that rely mostly on property taxes." The tax burden carried by Lake County residents is already high, Wyatt said. "In the 14th District which I represent, the property tax rate, for the most part, falls as follows," he said. "North Chicago 18 percent, Waukegan 16 percent, Lake Bluff 12 percent, Park City 11 percent, and Gurnee 10 percent. My district happens to have some of the highest property taxes not only in Lake County but in the state of Illinois. Further increasing the tax rate not only at the local level but now at the state level would cause further economic damage to our community." The Lake County Board voted earlier this month to place the non-binding referendum for a ban on a statewide property tax on the ballot for Lake County residents in November's general election. Wyatt, a Democrat and a CVS Health financial analyst, was appointed in June 2017 to fill the seat left vacant by the death of longtime board member Audrey Nixon. Wyatt lost his bid for a full term in the seat during the Democrat primary in March to former board member Angelo D. Kyle. Kyle is running unopposed in November's General Election. Lake County's 14th District includes Park City and portions of North Chicago, Waukegan Gurnee and Lake Bluff. The Lake County ballot question follows a proposal by the Chicago Civic Federation and the Federal Reserve Bank of Chicago in April when a Chicago Federation speaker proposed an across-the-state tax levy. The tax would be a special property assessment estimated at about 1 percent of actual property value each year for the next three decades. That special property assessment would be in addition to current property taxes Illinois. It's a proposal that Illinoisans cannot afford, Wyatt said. "The citizens and Business can't afford this a new property tax from the state," he said. "Of course, we should be looking at ways that could cut cost at the local level. Every year there is talk about getting rid of townships. This could save myself about $60 on my tax bill. But, if we had a legitimate discussion on consolidation of school districts we would see a much larger share of savings." The first step toward a better solution would be to address the line item that takes "the largest share" or property taxes, Wyatt said. "Schools account for 55 percent to 70 percent of the tax bill around Lake County," he said. "Looking at eliminating some of the 52 different school districts that don't always match up to local city and village boundaries would be the kick we all need." Wyatt said he understood the apprehension that idea could cause school board members. T he Lake County Board passed a resolution to put a non-binding referendum on the November ballot asking residents if they support amending the state Constitution to ban the implementation of a statewide property tax. Board members argued over whether or not that type of referendum was necessary given that no such tax proposal is pending, but an article in Crain’s Chicago Business in May reported that three members of the Federal Reserve Board had made such a suggestion as a way to fund state pension liabilities. The referendum was discussed at a committee meeting last week. Paul Frank, District 11, said the board’s longstanding policy is not to create referendum questions unless they have to do with the County Board. Judy Martini, District 5, said she has no problem with putting the referendum on the ballot. “I want to make it clear the County Board is not voting to support. We’re just putting it on the ballot. We are not taking a position on this. Sidney Mathias, District 20, said he doesn’t believe this opens the door to more referendums, nor break the board’s policy of only having referendums that have to do with county business. Steve Carlson, District 7, said he felt the referendum was meaningless. In fact, he added, “It’s an expense to taxpayers to put it on the ballot. This is a waste of time folks. “It’s unfortunate. It’s politics. It’s meaningless,” he said. Carlson said by circumventing the boards policy and rules not to have referendum questions that are not germane to Lake County government, board members are opening themselves up to others, like questions about Second Amendment rights or building a wall along the Mexican border. “Do we vote on that?” he asked. Both Mary Ross Cunningham, District 9, and Vance D. Wyatt, District 14, said the referendum will have no impact. The measure passed by a vote of 11 to 7. Vance Wyatt Election Campaign, a candidate committee, reported receiving $9,986.10 from Jan. 1 through March 31, according to its first quarter report to the Illinois State Board of Elections. Vance Wyatt is an Independent. The committee reported $3,800 in individual contributions and $5,518.10 in loans. It also reported $668 in in-kind contributions. After much debate, a divided Lake County Board voted Tuesday to ask Gov. Bruce Rauner to alter legislation that could change how the county's chief assessment officer is chosen. A bill that would let voters decide if the officer should be an elected position awaits Rauner's signature. It's a board-appointed post and has been held by Marty Paulson since 2003. If Rauner signs, a binding question would appear on Nov. 6 ballots in Lake County. The post would be up for election starting in 2020 if voters approve the plan. The county board voted 14-5 to ask Rauner to use his amendatory veto power to expand the legislation so the same question appears on ballots for the roughly 60 Illinois counties that have board-appointed assessment officers and board-chosen chairmen, just as Lake does. The assessment officer coordinates property tax assessment activity throughout the county. Proponents of the state legislation have complained about Lake's high property taxes and have said electing the chief assessment officer would give residents more control over those taxes. Opponents say the bill illegally singles out Lake County. They also say the assessment officer has little control over the amount of property taxes homeowners pay because tax levies are set by local government boards. Some critics also have complained the plan was rushed through the General Assembly without giving county officials an opportunity to give input. "It's just the way it got here and how it was done," said county Commissioner Mike Rummel, a Lake Forest Republican. A crowd of county residents concerned about the issue attended Tuesday's meeting in Waukegan, and they overwhelmingly supported the legislation as written. They included Zion activist Clyde McLemore, who said giving voters the ability to elect the assessment officer "takes control away from this board" and improves government transparency. The meeting got a little wild when McLemore made an unrelated remark about Commissioner Mary Ross Cunningham of Waukegan, leading to a heated exchange between McLemore and board Chairman Aaron Lawlor in which Lawlor repeatedly told McLemore to sit down. County commissioners spoke at length on both sides of the issue. Highland Park Democrat Paul Frank was among those who supported the bill as written. "I don't think we should be standing in the way of voters," Frank said. Fox Lake Republican Judy Martini criticized the county resolution, too. Lake County's high property taxes are a problem, Martini said, "and we've got to address that problem." Joining Frank and Martini in voting against the county resolution were Lake Bluff Democrat Sandy Hart, North Chicago Democrat Vance Wyatt and Grayslake Republican Jeff Werfel. On the other side, Lincolnshire Republican Ann Maine said she was fine with giving voters the ability to decide whether the assessment officer is elected or appointed. But Maine also criticized the bill for singling out Lake County, and she backed asking Rauner to amend it. Fox River Grove Republican Michael Danforth was harsher, calling the legislation disingenuous. Electing the assessment officer will not affect property taxes, he said. "We have the skin of the truth stuffed with a lie," Danforth said. "And that's not a sausage the guy in this chair is going to eat." A Rauner spokeswoman said the governor is reviewing the legislation but declined to say whether he plans to sign or veto the proposal. The bill is the third piece of state legislation in the last five years to target Lake County government. In 2013, the General Assembly stripped election oversight from the county clerk and created a Lake County election commission. A judge declared the law unconstitutional. Last year, legislators approved a plan to let voters elect the county board's chairman, rather than continuing to have members choose their leader. Rauner vetoed it. The Lake County Board may ask Gov. Bruce Rauner to alter legislation designed to make the county's chief assessment officer an elected post rather than appointed. A bill that would let voters decide how Lake County's assessment officer is hired has cleared the legislature and is awaiting Rauner's signature. If Rauner signs, a binding question would appear on Nov. 6 ballots in Lake County. The post would be up for election starting in 2020 if voters approve the plan. Lake County officials are weighing asking Rauner to use his amendatory veto power to expand the legislation so the same question appears on ballots for the roughly 60 Illinois counties that have board-appointed assessment officers and board-chosen chairmen, just as Lake does. The board will debate forwarding the veto request to Rauner Tuesday. "We support the right of voters to make this decision," said Chairman Aaron Lawlor, a Vernon Hills Republican. "But if it's such a good idea, why not make it applicable (elsewhere)?" The bill, which had bipartisan support in Springfield, is the third piece of state legislation in the last five years to target Lake County government. In 2013, the General Assembly stripped election oversight from the county clerk and created a Lake County election commission. Lawlor sued to block the change, and a judge declared the law unconstitutional. The latest bill singles out veteran Chief Assessment Officer Marty Paulson's job. Paulson's office coordinates property tax assessment activity in Lake County. It oversees the work of township assessors and mails annual assessment notices to property owners, among other duties. Paulson, who through a spokeswoman declined to comment, has feuded with some township assessors who said he ignored their reassessments. Paulson and the county have been sued twice by those assessors, but both cases were dismissed. State Rep. Sam Yingling, a Grayslake Democrat, championed the legislation. He has called Lake County's property tax system "dysfunctional" and said the chief assessment officer can unilaterally increase assessments and drive up taxes. But county board member Craig Taylor, a Lake Zurich Republican, believes the legislation stems from the disputes between Paulson and the assessors. Taylor said some GOP lawmakers who backed the bill didn't know about those fights. "They've been duped, in my opinion, into going along with this," Taylor said. "Why would you want to have an assessor who's tied to a political party?" Yingling isn't the only Democrat tying Paulson's nonelected status to the county's relatively high property taxes. So is county board candidate Julie Simpson of Vernon Hills, who's challenging Lawlor and made a campaign video supporting the legislation. In the 30-second spot, Simpson calls the proposed amendatory veto "a deceitful, political maneuver that deprives us our right to vote." Adding counties will create a delay and prevent the question from appearing on this November's ballot, Simpson told the Daily Herald. "If other counties are interested in passing similar measures, they are welcome to learn from the grass-roots campaign that was built in Lake County," she said, referring to a local petition drive against a veto. "We need reform now, not two years from now." Critics of the legislation, however, say changing how the assessment officer is chosen won't lower tax bills. "The only way to materially effect property tax reduction is a reform of the way schools are funded," said county Commissioner Steve Carlson, a Gurnee-area Republican. Carlson also dislikes that the legislation targets Lake County, even though most of Illinois' 102 counties appoint chief assessment officers in the same manner. To Carlson, the bill smacks of previous legislative attempts to weaken Lake County politicians. "This has been tried twice before and failed both times," he said. "It will fail again. It will either be vetoed or it will eventually lose in court." A Rauner spokeswoman couldn't be reached about the governor's plans for the bill. Not all county commissioners want a veto. North Chicago Democrat Vance Wyatt supports putting the question on Lake County ballots as proposed. "We need to look at all options for (tax) reforms," he said. Still, Wyatt said he would have preferred the proposal come from the board or citizens rather than legislators. 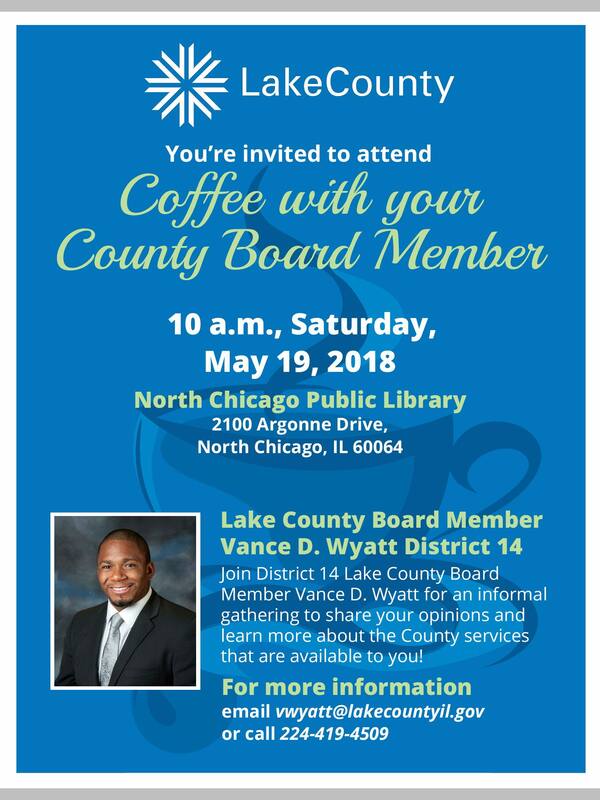 Lake County Board Member Vance D. Wyatt hosts his second quarter coffee with your County Board Member of 2018. It’s an informal gathering for residents to share opinions and learn more about some county services that are available to them.